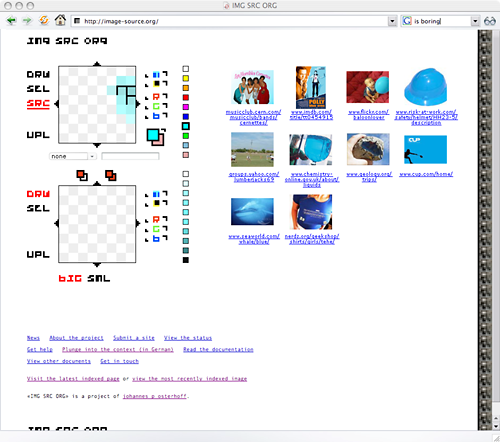 For my master project I made a search engine with an interface that lets you search images by composition. The book IMG SRC deals with its context. IMG SRC ORG was my final project at Merz Akademie in summer 2006. It consisted of a search engine that was crawling Wikipedia for images. A special interface, returned visually similar images in reply to simple user sketches. On the image below, the first canvas (top left) has been partially painted in blue. Some of the areas have been “pressed” and query the database for images that match these visual criteria. Selecting an image on the right, places them on the second canvas (bottom left). From there areas or whole images can be copied back to the first canvas. This mixing of various images, the image editing features and the instant response in the search result set, facilitates complex visual image searches. or read more about it in IMG SRC, the book on the context of visual image search (in German).